Have you ever heard someone say that if Jesus returned today, He wouldn’t recognize the Church? This sentiment seems to pop up now and then, often on social media, posted by people who revel in finding fault with the Church. It’s true that in every age of history, Christians have done things that would make Jesus cringe. But to say that He would not recognize the Church is to imply that somewhere along the way the Church went completely off track — that the Church that Jesus founded was meant to be something other than what it is. The truth is, Jesus promised that this would never happen. As recorded in Matthew 16:18, Jesus said to His apostles, “On this rock I will build my Church, and the gates of the netherworld will not prevail against it.” This is Jesus’ promise that the Church will never go so far astray that it becomes something that it was not meant to be. If the Church did become something Jesus would not recognize, then hell will have won. There will always be times when Christians fail to live up to the standards set by Jesus and the apostles. There certainly have been times when the Church as an institution has failed to embody her own values. But those values survive the failures, and the foundation of the Church (including her creeds and sacraments) is not shaken. So, we are confident that if Jesus returned today, He would recognize the Church. He would recognize the Church in her doctrines, in her worship, and in her service in the world. And he would also recognize the world, because our world is looking increasingly like the world of the Roman Empire in which Jesus lived and ministered. We believe that the Church can change the world for the better again. So, if the Church can change the world again, how will that happen? For us to answer that question, we have to be clear that the Church, as we are talking about it, is not simply an institution. It is not as though we can sit back and wait for bishops and other clergy to change the world. Instead, when we think of the Church, we have to be mentally looking in the mirror. We are the Church. You are the Church. So, whatever the Church is going to do, she can do it only if you step up and participate in it. The good news is that Christian churches are everywhere; they exist throughout the world. You are part of something much bigger than yourself, but at the same time, you are not insignificant because Christianity worldwide is counting on you to make a difference wherever you are. This article is adapted from a chapter in How Christianity Saved Civilization. Christians and Christianity have made the world a better place. The revolutions of the Church can be broadly grouped into two categories: the protection of all human life and the protection of each person’s dignity and freedom. These improvements are based on the conviction that every human is a rational creature made by a loving Creator in His image. Regarding the protection of all human life, the Church affirmed that, since we are all made in the image of God, no one is expendable, and no one can be used or exploited by another as if he were property or a commodity. The Church rejected the common social hierarchies of the ancient world and affirmed that all people are equal and equally valuable in the eyes of God (Gal. 3:26–29). Perhaps the high rate of infant and maternal mortality in ancient Rome contributed to a general desensitization to death and, in particular, to the idea that women and children were less valuable to society than men. But (the historical failures of some Christians to fight for human life notwithstanding) the Church rejected such an idea, and, in the big picture, Christians refused to accept the myth that great suffering and desensitization to death had to be a part of life. In a world where men were criticized for mourning the death of a baby, women and children were not protected by the law, and marriage was a contract meant to facilitate the consolidation of wealth, Christians affirmed the sanctity and worth of every person — especially the most vulnerable. Women and children were not to be exploited, and they certainly were not to be treated as disposable. Instead they were to be protected and educated. The weak and the sick were to be cared for, not abandoned. Violence was rejected. And the family was empowered to be a place of safety for all members. Thus, the Church worked and fought for life — and, eventually, Christians converted the empire to their way of thinking. The legacy of the Church, in the Western world especially, is a shared assumption that civilized people must be concerned for human rights. In the second category — the protection of each person’s dignity and freedom — the Church went beyond basic human rights and affirmed the freedom of every person to define his life. Foremost was the freedom for each person to worship according to his conscience. The emperor Constantine, in spite of his flaws and failings, understood that conversion had to be voluntary, according to one’s free will. We also have Constantine to thank for making Sundays a day off from work — one day a week dedicated to religious observance. In this way, he facilitated the Church’s understanding of the dignity of the laborer, who required a balanced life of work, rest, and prayer. Freedom of religion also means that a person has to have the free time to worship and must be free from being worked to death. Laborers must not be exploited and deprived of peace, relaxation, and time with family. Equally important is the Christian understanding of the resurrection, as opposed to the philosophical afterlife of a disembodied spirit or the pagan afterlife of a shadowy numbness. Christianity not only overcame death; it overcame the fear of death, giving people the freedom to live for others, according to God’s revealed will, without so much anxiety over self-preservation. It would not be an exaggeration to say that we have the Church to thank for most of the best art that has ever been produced. This includes a wide range of music that simply would not exist without the influence of the Church. The Church also supported many of the world’s most significant scientific discoveries and inventions, and many Christians are directly responsible for important advances in science and medicine. Thus, humanity realizes its potential as created in the image of God only when people have the freedom to imitate their Creator by being creative. The Church has been the patron of true freedom — the freedom to pursue happiness. This is not a selfish freedom in which a few people have absolute license to do anything they want at the expense of others. This is not a bought-and-paid-for freedom, the privilege of an elite class who enjoy it while the majority have little or no freedom. This is a freedom that includes responsibilities — the responsibility to protect others, especially those most vulnerable to exploitation. Those in power have the responsibility to protect the lives, the dignity, and the freedom of the rest. Leadership is meant to be a form of service. Leaders are not supposed to serve only themselves and their own social class; they are supposed to be the servants of those whom they represent. Since God is love, we are called to emulate God by loving our neighbor, and there is no one who is not our neighbor. Therefore, when we speak of traditional Christian values, this is what we mean. We mean the protection of human life, which includes support for marriage and the family; and we mean the protection of human dignity and freedom, which includes ensuring the safety of those most vulnerable to abuse, exploitation, and destitution. And these values, which were built over the centuries via divine revelation and historical Christian consensus, must not be marginalized. Freedom of religion is more than freedom of worship. It is also the freedom of religious expression — the freedom to speak and live the faith. Assuming that we are committed to being the Church and changing the world again, we will have to go into this with our eyes open. There is already real persecution against Christians in many places in the world — in some places, by governments dominated by other religions; in other places, by the new paganism. But even where persecution is not life-threatening, there is a growing cultural persecution that threatens to marginalize Christians and cut us out of polite society. Based on the erroneous assumption that truth evolves, Christians who stand for the historical values of the Church are dismissed as backward, unenlightened, and superstitious. Those who hold traditional doctrines and live by traditional Christian ethics are criticized by society’s elites as being behind the times and so not worthy of a place of respect in public discourse. The original pagans leveled the same charges at the Christians in the early centuries. Now the Church’s influence in the culture is being eroded and erased. In an attempt to replace religion as an influence on culture, secularism has become a religion — and its creed includes intolerance of Christianity. Unfortunately, Christians are partly to blame for this when they capitulate to the pressure to conform to the latest trends of the culture, sometimes even to the point of seeming to apologize for being Christian. But what is possibly the greatest danger to the health of our society is that in the United States, the religion of secularism is becoming the state religion — counter to the prohibition in our Constitution. And this phenomenon is happening not only in the United States but in other countries as well. Assuming that we, as the Church, do not resign ourselves to letting the world quietly be stripped of religious faith, we will have to be ready to be strongly criticized when we speak up in support of our Christian values. Charges of discrimination and perhaps even legal action may occur when Christians fail to conform to the “new truths” of the neo-pagan world. This will be the new persecution, allowed and even applauded in places that supposedly enjoy freedom of religion (because they really mean freedom from religion). But take heart, because Jesus said, “Blessed are you when they insult you and persecute you and utter every kind of evil against you falsely because of me” (Matt. 5:11, NAB). We could say that if you’re not getting any criticism at all, it might be because you are hiding your light under a bushel (Matt. 5:14–16). Be careful of selling out to the culture — it’s easy to do, and it’s the more comfortable option. Beware of falling into the trap of believing that truth evolves and the new “truths” are more enlightened than the old ones. Values based on revealed truth, not human speculation, are what make the world a better place. And changing the world will require an integrity that recognizes and embraces the Church’s role as countercultural. 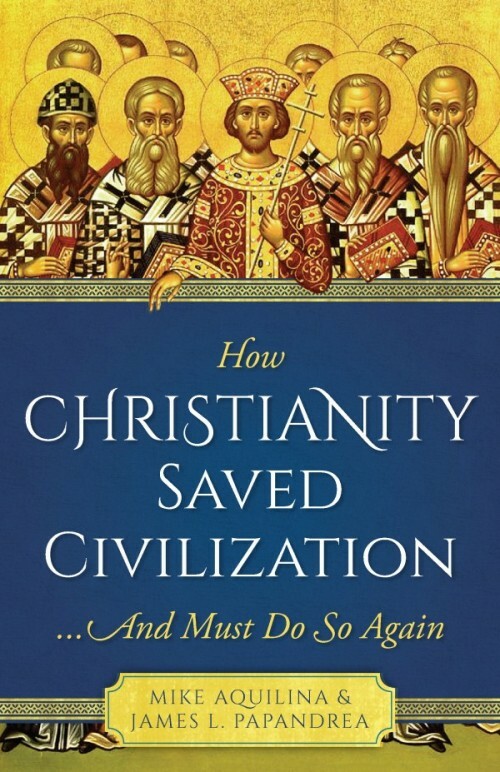 Editor’s note: This article is an excerpt of a chapter from How Christianity Saved Civilization…And Must Do So Again, and is published here courtesy of Sophia Institute Press.